It was 34 years ago today that the legendary Rock N' Roll singer, Elvis Presley, passed away. It is amazing how his charismatic style and music still influences today's music scene and people still adore him so much. 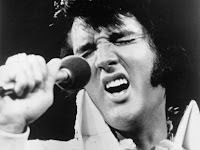 I dedicate this song, Love me Tender as today's song of the day to celebrate his life. RIP Elvis.